Yesterday, in a hotly contested matchup, Pandita Ramabai made it past William Wilberforce 55% to 45% to claim the second spot in the Faithful Four. She joins Martha of Bethany and awaits two more companions as we move ever closer to awarding the coveted 2019 Golden Halo. On tap today we have Ignatius of Loyola vs. Gobnait. To get to this point, Ignatius made it past Tikhon of Zadonsk and Marina the Monk, while Gobnait defeated and Hrotsvitha and Paula of Rome. Also, in a move of largesse reminiscent of the recently defeated Nichols of Myra, the Supreme Executive Committee has devised a method for giving away (yes, for free!) the last three remaining France Perkins Golden Halo mugs. Rather than donating them to the Lent Museum, they will be given away at random to three lucky winners. Click here for details. And if you gave up Facebook for Lent or for Zuckerberg, add not being eligible to your list of crosses to bear. Alas, it’s Lent. Leo Tolstoy quite famously did not write in Anna Karenina that “tasteful saintly goods are all alike; every kitschy saintly good is kitschy in its own way.” But he should have – because it’s true. Year after year, Lent Madness digs for Saintly Kitsch, and you’d think, after ten years, we’d run out. You might begin to think that the jig is up, the game is run, the kitsch is kaput! Never fear, dear reader, never fear. When you have a saint as popular as Ignatius of Loyola, you’ll never be wanting for kitsch. Perhaps you’ve seen the portraits of Ignatius from previous rounds and thought, “you know, he seems ok, but I don’t know I like the cut of his jib.” Well, for the low price of $9.00 on Etsy, you won’t have to look at Ignatius’ jib at all – because this Ignatius’ jib is covered with a BIG BUSHY BEARD! To be clear, while Ignatius did have a beard, and Ignatian spirituality does ask you what you desire, Ignatius is not Santa Claus. Sorry. If you’re trying to chase down Ignatius, then exercise is important. Physical exercise does the body good and leads to healthy living; the Spiritual Exercises of Saint Ignatius help us examine our desires, discern the movement of God in our lives, and find God in all things – giving us spiritual health. 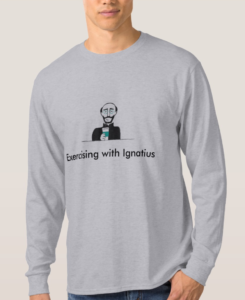 And thanks to the good folks at Zazzle, for $34.85, you can let folks know you’re working through the spiritual exercises as you do your physical exercise, with this snazzy “Exercising with Ignatius” tee-shirt. The t-shirt shows our hero sitting happily with a cup of coffee. After all, if you’re going to find God in everyday life, you need to be sure to have your caffeine fix as you begin the day. 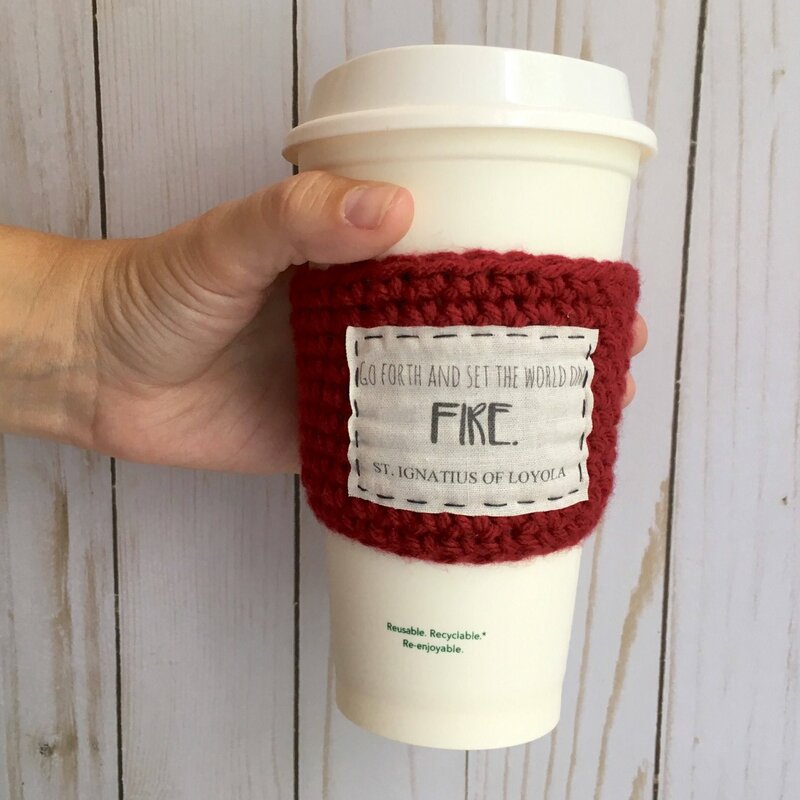 Luckily, an Ignatius of Loyola knitted coffee cozy can keep your coffee hot and your hand cool! It’s only $16.95 on Etsy, and includes a quote Ignatius supposedly used with members of the Jesuit order – “Go forth and set the world on fire.” Just make sure your coffee isn’t fire-hot. That would be painful. Ignatius sought to develop contemplatives in action – but even contemplatives in action need to rest. So as you wind down your day, pray your examen, and resolve to respond to God again tomorrow, you can nest your head one person’s paraphrase of Ignatius’ spirituality. Rest well. Tomorrow, there’s work to be done for the Greater Glory of God – AMDG! Saint Gobnait is one of the national saints of Ireland – her story is tied to the place where she waits for her resurrection. 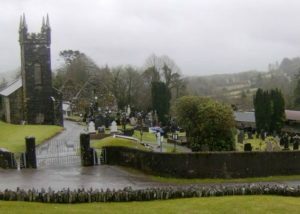 What a great reason to travel – a pilgrimage to picturesque Ballyvourney, in County Cork. 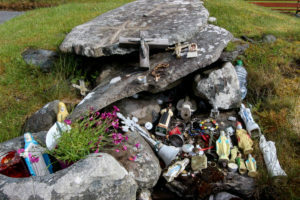 Once you’ve visited the church there you can continue with the other pilgrims to the ruins of Gobnait’s house, her gravesite, and pray for healing at Gobnait’s Well. Or perhaps you are looking to get into the spirit of Gobnait a little more locally. What better way to remember Gobnait than to make a home for her beloved bees! 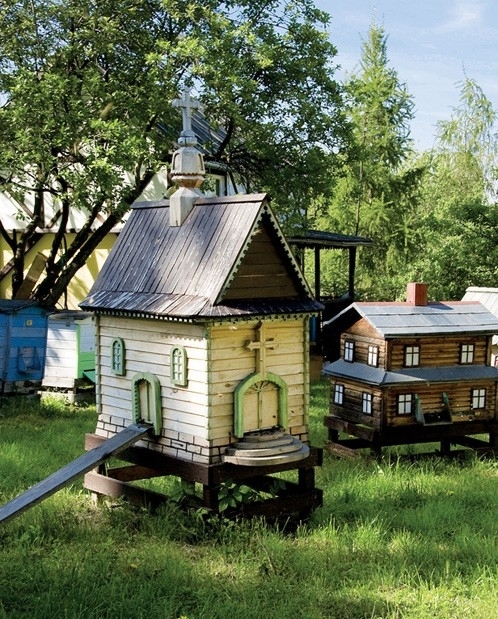 Remembering that saving the bees is saving God’s creation, why don’t we make more hives shaped like churches – reminders of the holy work of caring for creation. If you provide a home for Gobnait’s bees, you will also want to provide them with food. As you plant you plant a bee-friendly garden, say prayers of intercession for those in need of healing and for our world. Beeswax is often associated with Easter, as we light the new fire of the paschal candle. But with an artistic eye we could weave the wax form Gobnait’s bees into remembrances of every season, including Christmas. Whether you make a pilgrimage to Ballyvourney, stay home and plant a bee garden, or fashion beautiful devotional art from beeswax, show your support for the Gobnait every day. 123 Comments to "Ignatius of Loyola vs. Gobnait"
To Ignatius we give approbation. Can I tell you ‘bout Ignatius? Or of Gobnait and her bees? You’ll complete your vote with ease. When do we hear about the Jesuits? Not confined by Abbey walls. So they can find God in all. Gobnait, ooh that is good. You collapsed it with your ball. Stopped the plague for one and all. And now I understand her well heals pilgrims. To show their journey worked. So they build the convent there nestled in the trees. Employed her cunning and her wits – and swarms of killer bees. Both Spain and Rome’s Inquisitions. Contemplatives should be in action. I’m amazed this quadrant’s through. They are the last monastics. One more week until we’re finished. The winner crowned with gold, not plastic. Monastic/plastic? Bwahaha! I didn’t need YouTube for this one. Love me some “Superstar”–especially this time of year. Thanks, Michael! This is one of my favorites! Great job. Oh come on! What’s the buzz? You _know_ it’s Gobnait’s bees. Oh touché, Beth! How perfect is that! That was the theme, Beth. Kudos, honey. Thank you, Michael, for your lyrics. You have outdone yourself today, and that was a formidable task! WOW a winner for sure! Do you do this for a LIVING? Because you SHOULD!!! Again a difficult decision. I would love to visit County Cork Ireland but for today I voted for Ignatius because I want to read Spiritual Exercises and because God is not confined to our church. It wasn’t mentioned in the post, but there’s a plentiful supply of lovely Gobnait charms, posters, tee shirts, and other kitsch on Etsy. 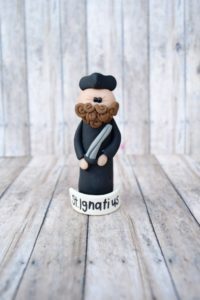 I love David Sibley’s terrific promotion of Ignatius and his kitsch, but our bees need a holy advocate more than ever today, so I’m voting for Gobnait and planting a flower garden. Gobnait all the way. In these times, we need a saint for the natural world. So torn. Jesuit educated, 2 of 4 kids Jesuit educated, but recent Jesuit grad doing a year of service in Ireland. Going with Gobnait this morning since I just got to visit her in that amazing country. I have to go with Gobnait and her bees. We need her care for bees and other pollinators rather desperately today. While she is no doubt interceding for them and us, it would bee the height of ingratitude not to express our appreciation for that intercession and her witness all those centuries ago. Besides, that beehive church is one honey of a structure. Well, I’ve waxed on about this subject for long enough. GO GOBNAIT! You are so wonderfully corny today, Diana!! How do you pronounce Gobnait’s name? I presume it’s Gaelic. I found this; maybe Irish Gaelic is at least close, if not the same. From babynamespedia.com: [ 2 . go-bnai(t), gob-na-it ] The baby girl name Gobnait is pronounced GAAB-NEYT †. Gobnait’s language of origin is Celtic and it is predominantly used in Irish. The name Gobnait means ‘little smith’. The name is of obscure origin; it could be from goba, alluding to Gobniu, the Celtic god of craftsmanship. It was later borne by the 6th-century Irish abbess and patron saint of Ballyvourney in Munster. The name is today still in use in west Munster. Gobnait is the feminine form of the Irish Goban. …. 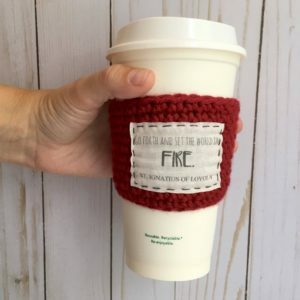 That’s really a crocheted coffee cozy. But hey, coffee cozy ! I’m contemplating on my vote for Ignatius. Ignatius of Loyola vowed to exterminate all the Anglicans. It’s Gobnait for me! Would you please direct me to documentation, preferably a primary source, that he “vowed to exterminate all Anglicans”? I know he was deeply concerned with sending missionaries to England because of what was, legitimately in his POV, heresy, but I’ve never heard that he wanted to kill people. Last year during Lent Madness, I became fascinated with St. Dymphna, an Irish saint. This year, another female Irish saint has caught my eye: St. Gobnait. I mean, the woman commanded bees, for heaven’s sake! How cool is that? I must admit, Harry Clarke’s drawing for the Saint Gobnait window in Honan Chapel, Cork, Ireland had an enormous impact on me. It’s utterly stunning! St. Ignatius has been praised and acknowledged for ages, plus there’s that whole anti-Semitism thing muddying his saintliness, so I’m in favor of honoring…and voting for… the Irish lass. The “anti-Semitism” thing was not of Ignatius’ doing: the infamous 1593 resolution you’re presumably referring to occurred thirty-seven years after Ignatius’ death in 1556, and ran directly counter to his actions in life. Ignatius shouldn’t bear unearned guilt for mistakes made by individuals belonging to the Order he founded. Only a 10-vote spread! Come on – save the bees!! I just planted sage in my front yard and before I was done with the last plant, bees were showing up. Gobnait for sure. You have an excellent heart, Ms Susan. May it long continue to warm the world. Have you checked your spam folder recently? To put it another way, have you had a recent message from a member of the SEC? You make me blush, St C. Thank you. I want to vote for both. 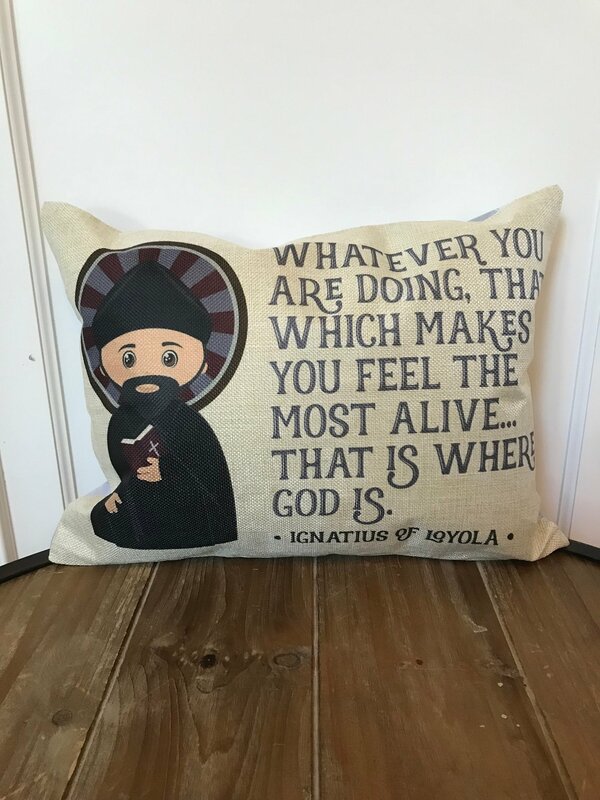 The pillow at the end of the post for Ignatius of Loyola seems to be tipping me towards him. The words on it speak to me. Whatever you are doing, that which makes you feel most alive, that is where God is. If I only I could get paid to do that which makes me feel most alive. Going with Gobnait for the bees and the flowers. With bees in crisis around the world, and our ecosystems dependent on them for survival, I had no choice but to go with Gobnait. And yes, I was powerfully swayed by that beeswax Nativity scene! 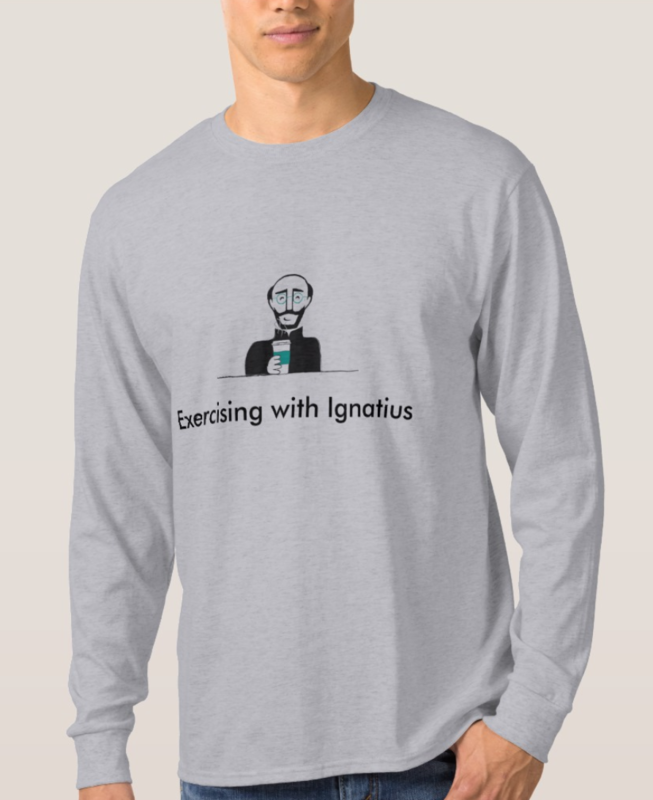 I want one of those “Exercising with Ignatius” t-shirts. How about Gobnait’s My Honey? I’m considering an Internet search for a bobblehead Ignatius. Several years ago a professor at Perkins had a bobblehead Jesus on his filing cabinet. Quite a few people, including but not limited to faculty, staff, and students, asked him to sell it to them or leave it to them in his will. Sadly for us, nothing could separate him from this icon. More proof that God has a sense of humor. Our bees are in trouble – it’s bad! Yet our Bee Patron Saint is most rad. That our world, once again, is plant clad. Besides, how can we vote for someone who hated Anglicans? Not sure a vote for Abbess Gobnait is a vote for bees, though as God’s creatures, without free will to sin, they too wear haloes. Ignatius’s influence is the greater, so I go with him. All bring me into the presence of God. Easy peasy. Gobnait for the Golden Halo! Hokey smoke! This is turning into a real battle. With upsets all over the place, can Gobnait take down Ignatz? Not in kitsch, that’s for sure! 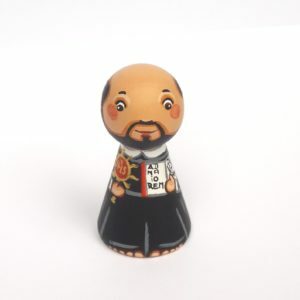 You did what you could, David Hansen, but let’s face it, when it comes to kitsch, St. Ignatius has it all over the Gob! I’m voting for the man! And I want that peg!!!! But I don’t want to spend $26 on it. So if you’re planning on a Christmas gift for me, you know what to get. I just want to say thanks, Richard – I look forward to your posts every day. Wherever you are, I like to imagine going to the local coffee shop and seeing you walk in – wry grin and jaunty halo in place. Your comments always make me smile and often influence my vote. Ignatz! I have liked Gobnait (have even suggested that as a name for my coming grandchild – parents aren’t biting) – but am voting for Iggy. Thanks again for your presence every year in Lent Madness! No offense taken, St. Celia. I would never think of that “other” meaning. I’m blushing. You’re too kind, Jeanine. Thank you. I love Lent madness, I learn so much and the commenters are so thoughtful. Too bad it’s almost over. Thank you for the link! Who wouldn’t want the Gobnait “Chubby Bee” Necklace? Bit pricey though. Patriartsgallery.com what a great discovery. Thank you, bloggers! This is great kitsch. I opened the link to read the kitschy offerings today, having already decided to vote for Gobnait of the Bees, partially because I’m in the process of planting a bee garden. However, the Ignatian kitsch got to me and won the day. Great job, David. I want one of those pegs! And I love the Daily Examen. I never heard of Gobnait before and I am a big fan of everything Irish and Celtic having my /Dna tested and finding I am 96% Irish and know all the words to Black Velvet Band. I did vote for Ignatius, however, but I must say that the writer of the Kitsch section for Gobnait did a phenomenal job finding and inventing stuff. Kudos!! Gobnait was the last thought I had before sleep last night, bees and gardens and her quirky name in my head. That made my vote clear when she came up for today .Call me crazy if you will! My vote today is for David Sibley. Well done on the kitsch, my brother. Well done. Gobnait’s ‘stuff’ is honey sweet and gave me a chuckle but Ignatz kitsch made me laugh out loud. . . and you writers! Thank youfor sharing YOUR gifts with the rest of the Lent Madness community. How delightful and insightful! Because of the plight of bees in today’s world, my vote goes to Gobnait. As people are spraying their lawns in the spring to kill dandelions, they do not realize that dandelions are a main source of food for the bees before flowers start blooming. The spray kills the bees. Save the bees! And vote for Gobnait while you’re at it!! Thank you for making me feel good about the dandelions in my lawn! A lawn with dandelions is infinitely better and more beautiful than one without! Dandelions and purple violets, with a little henbit thrown in for good measure! Have to vote for Gobnait with a beehive just newly established in an attempt to beat colony collapse this year. Maybe she will cause the deadly neonicotinoid pesticide to spill before it reaches the corn or whatever they put that stuff on, and our bees will make it through the season for a change. But I have to admit, her kitsch is pathetic! “Pathetic,” from the Greek, means “filled with feeling.” So, yes. 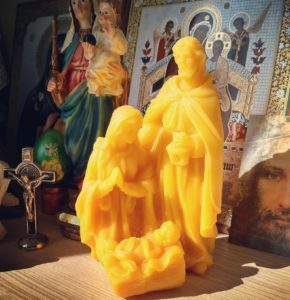 Nothing says “sweet” like a beeswax baby Jesus. Can’t I vote for both of them? I’m drawn to Gobnait because she’s Irish, but I’m drawn to Ignatius Loyola because I have a cousin who’s a Jesuit. And at 50%-50%, there’s no underdog to support. ^^^winner of Comment of the Day. Along with many others, I wish I could have voted for both. My husband and I visited Ireland a couple of years ago and the photo of Gobnait’s house/grave reminded me of some of the stone circles–thin places–we saw. So it’s Gobnait, for those places where we sense the Holy. Ooh!! It’s a really tight race, and I completely understand why. I wanted to bot for both of them. . Even though the coffee cozy almost drove me to vote for Gobnait, my loyalty to Ignatious won out in the end. But… someone should definitely make a classier coffee cozy to commemorate Ignatious of Loyola. This one is much to… kitschy. I voted for Gobnaint. Ignatius and the Jesuits are instruments of God and have done god, but we can’t pretend missionaries and the Catholic Church have not caused immense harm in many cases. How often the typo outdoes the intention! Gobnait’s bees are not always honey and sweetness. I carry a needle to prevent anaphylactic shock in case one gets too friendly. I voted for her anyway and hope if I ever get stung, she will remember I voted for her and intercede. That’s hedging your bets for sure! Gung by what Ignatius says, Whatever you are doing, that which makes you feel most alive, that is where God is, leads me to vote for Gobnait. Hmmm. How can I resist a sobriquet like Gobnait? Who can vote against her killer bees? Her Irish peace will bring me to my knees! But how then can I turn against Ignatius? He makes me think and sets my heart on fire! How can I ever choose? Whose words and deeds will holy lives inspire? “I think I must be loyal to Loyala”—Brilliant!! This and “Gobnait and Ignatius” will be going through my head today. The bees are in trouble, not of their own doing), because we have exploited them with pesticides, habitat destruction, etc. They need all the help we can give—sainthood of their patron should encourage us to honor Gobnait and in her name, petition the pesticide companies to also honor her by reducing or getting alternatives to their poisonous products. I recommend the group Beyond Pesticides.org. They have weekly missions involving emails to congresspersons, or commmittee chairs to advocate for some action to protect us from pesticides. It’s very easy to join and send the emails. Even though I have been to Ireland and visited Gobnait’s well as well as the church in the photo, I had to vote for Ignatius. If this round is about kitsch then Ignatius has some great stuff! Truly a match up where I am happy with either winner. This was a difficult one for me. I love and admire them both .. that said, I secretly hope Ignatius pulls ahead! I finally decided that the irony of Ignatius’s winning a largely Anglican halo would be too delicious to ignore. Take that, St. Iggy, you misguided, holy person! Hmmm, not sure how that posted twice – perhaps it’s a sign that Gobnait should win. But I didn’t vote twice! I promise! Ignaz and his ilk have never grasped the difference between heresy and schism. A smack could be the best way to go. Historical context, please! Nobody knew at the time that it was going to be a permanent schism. My point is that Anglicans are schismatics, not heretics. That was also the case in Ignatius’s day: perhaps even more so, as no additional articles of belief had been superimposed on the historical creeds. I believe that from the Orthodox point of view the Western Church, because of the addition of the “filioque” to the Nicene Creed, is both heretic and schismatic, but I’m quite out of my depth. I’ll do it for Santa. But from his POV, the Protestants *were* heretics. I like that he’s saying to try to change their ways with love instead of, you know, burn them at the stake. I think we can all agree that burning someone at the stake is a more serious offense than calling someone a heretic. However, words often have consequences, and words like “heretic” and “infidel” have an unfortunate history in Christianity and many other religions. Gobnait! Bee-cause. 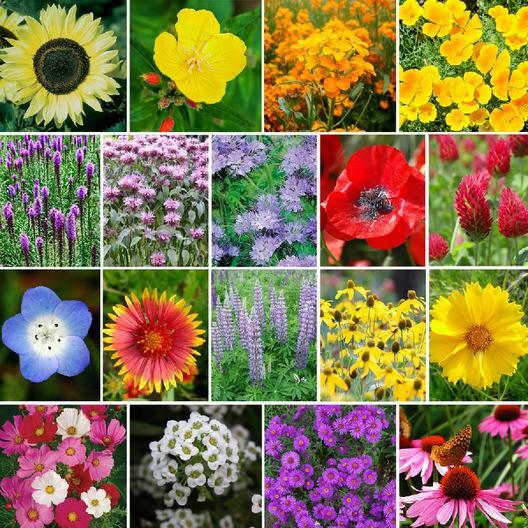 Flowers have brought joy and healing into my life, so I also like the idea of a bee-friendly garden. Another reason I voted for Gobnait was to honor a friend of mine who visited Gobnait’s Well a few years ago. St Ignatius had a greater impact on our world today. Ignatius has the kitschiest kitsch. He gets my vote today. Ignatius! Ignatius! Remember if you were a fan of the tv show, M*A*S*H*, Fr. Mulcahey quoted St. Ignatius of Loyola often. If St. Ignatius could get Fr. Mulcahy, Hawkeye, Frank, Hot Lips, and all the rest though the Korean War, he is your Saint! Great kitsch round for both of today’s saints. Well done, Celebrity Bloggers! I’m predicting an all female final four. On the other hand, Gobnait vs. Mary of Bethany will be a tough one I think. According to the bracket, it’s Martha of Bethany. Hello my name is Liam Hill. I’m 9 years old. Here’s what I have to say: on my paper I have this exact match up! Love Ireland, bees and flowers!! Go Gobnait!! Bzzt. After reading this story…yeah, gotta give Ignatius my vote. That is horrific!! In only 24 hours? Saints preserve us! Ignatius. I can’t believe “the church” isn’t matching up host families at the border. I can’t believe famine still exists or even that Puerto Rico is still in pathetic shape. I hope we can save the bees, I just don’t think Gobnait’s story will serve to built up the church to empower her to lead in saving our planet, to feed the hungry, or actually visit those in prison, or free the slaves of today. « Win a FREE mug!